Again a few lines to let you know how things are going. then we go to Philadelphia for six weeks & play there with "Mumming Birds" "Smoking Concert" & "Wow Wows" then we start round this circuit again at Cincinnati with the "Concert." 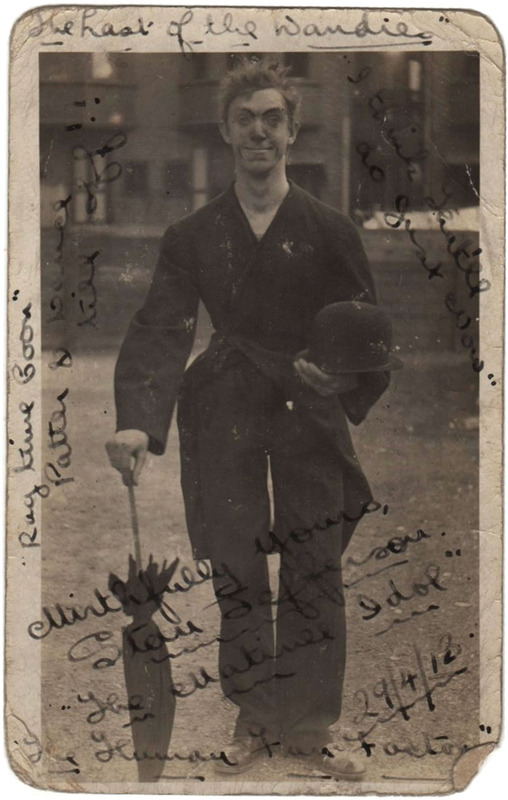 Karno sent a troupe out to South Africa a few weeks ago & Billie Moran went with them to play the Drunk. 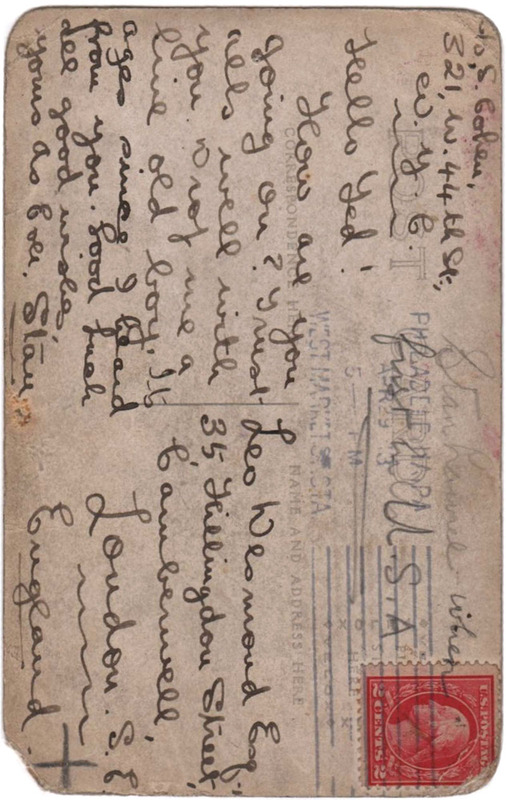 Had a letter from Flo, encl. the photo I'm sending you, isn't Miss Gertie a yell!!? I'd give anything to see the act now, what a screamer! Hope you rec'd the last letter from Los Angeles also the Music. I haven't got the "Performer Annual" yet. Just my luck. I suppose its been mislaid. Well we are playing in the Mormon City this week, I'm afraid I shall have to stay behind & become a prophet. Good bye for the present old boy. Kind thoughts & good wishes to Gert & self. Why not drop Karno a line now & then? You might get a chance you know! Ever heard anything of the Reed's? 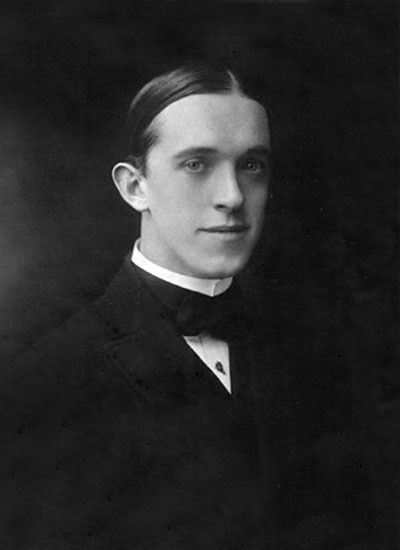 Ted Leo, better known as Teddy Desmond (1888-1962) and Stan Laurel worked together in 1912 as a comedy double act known as the Barto Bros. in a sketch called “The Rum ’Uns from Rome,” which Stan created with Arthur Dandoe. How are you going on? Trust alls well with you. Drop me a line old boy. Its ages since I heard from you. Good luck, all good wishes, yours as ever. The Selective Service Act (enacted May 18, 1917) authorized the U.S. Federal Government to raise a national army for the American entry into World War I through compulsory enlistment. 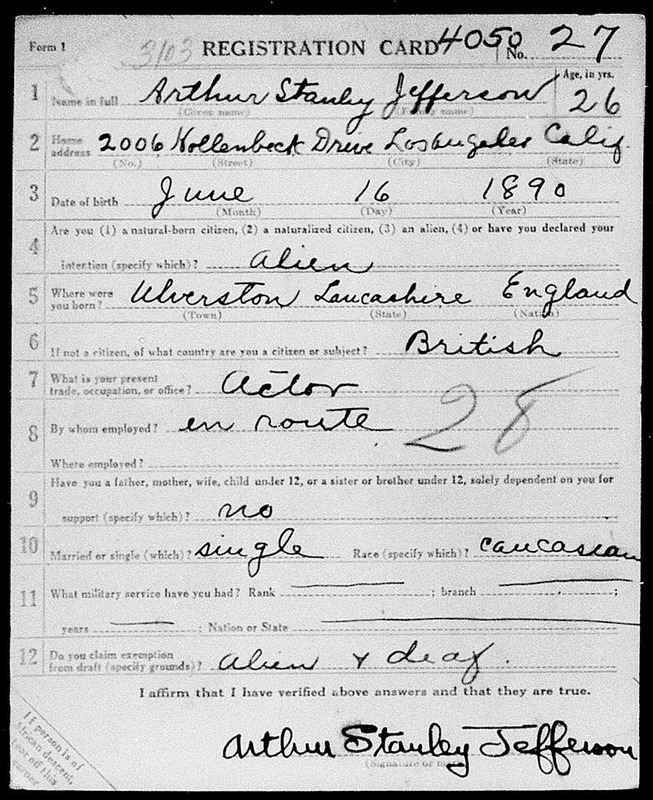 Stan’s registration card listed “slightly deaf” as a disability. Being an “Alien” was not grounds for automatic exemption, but neurological disorders—like deafness—were. 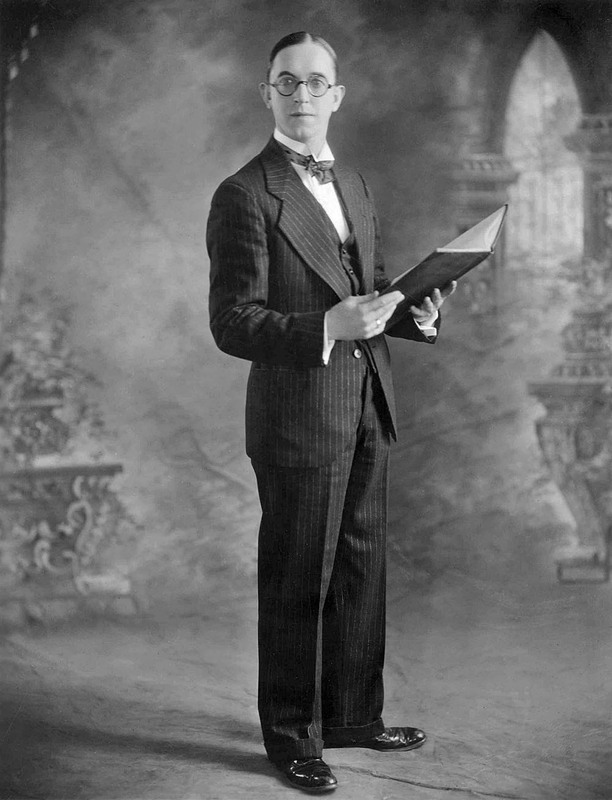 1st- The engagement is to begin on Monday, January 29th, 1923, and to continue for twelve (12) weeks. 2nd- You are to render services as an actor, playing the leading part in comedies of not less than one reel in length, to be starred and featured, and agree herein to use your best efforts at all times during the continuation of this engagement to produce the highest grade of work, and further agree to give us fullest co-operation possible to accomplish this result in an efficient manner. 3rd- It is mutually agreed that this engagement may be terminated by either party upon two (2) weeks notice to the other part, provided however that should an unfinished picture be in progress, either at the termination of this agreement or at the termination of the two weeks notice period herein provided, that you will continue the engagement until such time as the picture then in progress is completed in a satisfactory manner. 4th- It is mutually agreed that the Hal E. Roach Studios have the sole right to your services during the continuance of this agreement, and you will not render services to any other individual or firm for any purpose whatsoever unless the consent of the Hal E. Roach Studios is first obtained. 5th- It is agreed that you will abide by such reasonable rules and restrictions as are laid down by the studio for the guidance of others in its employ in a similar capacity, end will report promptly for work when requested to do so. 6th- You hereby grant to the Hal E. Roach Studios full privileges of publicity and advertising, both for yourself personally and for the pictures in which you are to appear, with the provision that all advertising of pictures in which you appear shall mention your name in a prominent manner. 7th- It is mutually agreed that the salary for this engagement shall be $300.00 per week, payable on Saturday of each week. 8th- In case of shutdowns on account of strikes, fire, acts of God, or other causes over which we have no control, it is agreed that this engagement will be suspended during the continuance of such shutdown and that it shall be extended for the length of suspension. 9th- It is hereby agreed that the Hal E. Roach Studios shall have the right to renew this agreement for a further period of one year at the rate of $400.00 per week and another additional year at the rate of $500.00 a week, at any time prior to the termination of this engagement, by written notice, it being understood that should this option be exercised a standard form of contract will be entered into. 10th- It is agreed that the signatures of the parties to this agreement appearing below shall indicate their respective acceptances of the provisions above set forth. FIRST: The said second party does hereby agree to render services to the first party as an actor in motion pictures for and during the term of two (2) years, commencing on the 5th day of March 1923, and ending on the 5th day of March 1925, or during such portion of said time as the services of second party may be satisfactory to, and desired by the first party, it being understood that said second party will faithfully and to the best of his ability perform such services as such actor as may be requested by said first party. SECOND: It is understood that, should the production of any film in which the services of said second party are required be in progress at the expiration of the term of this contract, or any extension thereof provided for in Paragraph Ninth hereof, the term of this agreement shall be extended until such film is completed, or the work of said second party terminated in a manner satisfactory to the first part, but such extension shall not exceed two (2) weeks and all the provisions of this agreement in effect at the expiration of said term, or such extension provided for in Paragraph Ninth hereof, shall be extended and retain in full force and effect during the extension provided for in this paragraph, it is also understood that should retakes be necessary after the expiration of said term, or of any extension thereof, provided for in said Paragraph Ninth, or after any prior termination of any such term or of such extension, said second party shall, and hereby agree that ha will, at the request of the first party, render services of the kind contemplated hereby in producing such retakes, and agrees to accept in full for such services payment for such days as such services are required at the rate of payment in effect hereunder at the termination of this agreement, it being understood, however, that all such retakes shall be completed within two (2) weeks following the termination of this agreement. THIRD: The second party agrees that during the life of this agreement, he will devote his entire time and attention exclusively to the services of the first party, and will perform the services above specified at such times and places as the first party may from time to time direct: that he will conform to such reasonable rules and regulations as said first party may from time to time prescribe for the conduct of its studios, and that he will report for duty promptly when called for work by said first party. FOURTH: The said second party further agrees, in consideration of the promises and of the advertising and publicity which he will receive in his profession through the release of films produced by the first party, that he, the said second party, will not, during the continuance of this agreement, appear in, direct, write, produce or assist in producing any motion picture, scenario or film, for any motion picture producer, or in any other manner engage in, or assist others in, any branch of the motion picture business, or appear or in any wise assist in the direction or production of any play, drama or other production upon any stage, or in any public or private performance, either as director, actor, lecturer or entertainer, or in any other capacity, except with the written consent of the first party. And the second party does hereby acknowledge that his talent is unique and of a peculiar and extraordinary nature, and of peculiar value to the first party, and that his talents and services cannot be replaced by the first party. The second party hereby grants to the first party the privilege of publicity in advertising the second party in connection with all the pictures in the production of which said second party may take part under the terms hereof; and first party agrees that it will exhibit and use the name of the second party in connection with the exhibition of the motion pictures produced by first party in which the second party appears as an actor. Said first party further agrees to mention the name of said second party in a prominent manner in connection with the advertising of all pictures in which said second party appears when the name of the picture is mentioned. FIFTH: The first party simultaneously with the execution of this contract has paid to the second party the sum of Four Hundred ($400.00) Dollars, as salary in advance for one (1) week's employment of the second party by the first party hereunder, it being understood that, in consideration of such payment and the agreements herein contained, the first party shall immediately be, and is, entitled to the services of the second party as hereinbefore specified, for the term aforesaid, or during such portion of said term as the services of the second party may be satisfactory to, and desired by, the first party, provided that the said first party shall at all times during which it shall avail itself of the services of the second party during the first year of said term, pay to said second party at the end of each week (except the first week) the sum of Four Hundred ($400.00) Dollars, as salary for such week; and at all times during which it shall avail itself of the services of the second party during the second year of said term, pay to said second party at the end of each week the sum of Five Hundred ($500.00) Dollars, as salary for such week. SIXTH: Said second party further agrees that if, at any time, by reason of any strike, fire, Act of God or other cause beyond the control of the first party, it shall be prevented from carrying on the work of producing films in connection with the production of which the services of said second party are required, the said first party shall be released from payment or the foresaid salary, or any part thereof; and the second party shall be released from the performance of service, during the continuance of such suspension as interruption of work. SEVENTH: In the event that, by reason of sickness or accident, the second party shall become incapacitated from performing the terms of this agreement for a period longer then one (1) week at any one time, thereupon the same shall be suspended, both as to services and compensation, until said second party shall have recovered, unless said incapacity or sickness shall have been caused or occasioned by reason of the second party having performed the duties stipulated to be performed by him under and by virtue of this agreement. EIGHTH: If at any time during the life of this agreement, otherwise than for the reasons set forth in paragraph sixth hereof, the said first party shall determine to suspend the making of any films in which the services of the second party are required, for a period of not to exceed three (3) months at any one time, it shall have the privilege of so suspending this agreement for such period: Provided, that it shall first give to the second party ninety (90) days' written notice of its intention to so suspend this agreement; and this agreement shall be suspended pursuant to said notice, both as to services and compensation, during the continuance of the suspension specified in said notice. It is further agreed, provided second party shall faithfully keep and perform this agreement, that the same shall not be terminated during its term, except upon ninety (90) days/ written notice from the first party to the second party; subject, however, to the provisions hereinbefore specified for the suspension of the same, both as to services and compensation. NINTH: It is understood and agreed that the said first party shall have the right and option, by notice in writing given to second party not less than ninety (90) days prior to the expiration of the aforesaid term of two (2) years, to extend and continue the term of this agreement for an additional year, and in the event said first party shall exercise said option, this agreement shall thereafter be construed and understood as if the term of three (3) years were specified and referred to wherever the term of two (2) years is specified and referred to in any clause or part hereof, except this paragraph, and in that event, the first party shall at all times during which it shall avail itself of the services of the second party during the third (3rd) year of said term, pay to said second party at the end of each week, the sum of Six Hundred ($600.00) Dollars, as salary for such week; and that the said first party shall have the right and option, by notice in writing given to second party not less than ninety (90) days prior to the expiration of the aforesaid term of three (3) years, to extend and continue the term of this agreement for an additional year, and in the event first party shall exercise said option this agreement shall thereafter be construed end understood as if the term of four (4) years were specified and referred to wherever the term of two (2) years is specified and referred to in any clause or part thereof, except this paragraph, and in that event the first party shall at all times during which it shall avail itself of the services of the second party during the fourth (4th) year of said term, pay to said second party at the end of each week the sum of Seven Hundred ($700.00) Dollars, as salary for such week; and that the said first party shall have the right and option, by notice in writing given to second party not less than ninety (90) days prior to the expiration of the aforesaid term of four (4) Years, to extend and continue the term of this agreement for an additional year, and in the event said first party shall exorcise said option, this agreement shall thereafter be construed and understood as if the term of five (5) years were specified and referred to wherever the term of two (2) years is specified and referred to in any clause, or part hereof, except this paragraph, and in that event, the first party shall at all times, during which it shall avail itself of the services of the second party during the fifth (5th) year of said term, pay to said second party at the end of each week the sum of Eight Hundred ($800.00) Dollars, as salary for such week. TENTH: Said first party, in further consideration of the services to be rendered by the second party in his capacity as actor under the terms of this contract, does agree to account for and pay over to the second party, twelve and one-half (12-1/2%) per cent. of the total net profit derived by the first party from the release of the films in which the second party shall have taken the leading part produced under this contract, and remaining after the payment of all expenses and costs, including overhead, connected with the making, production, exploitation, sale and distribution of such pictures. It is provided that any payments or advance on account of profits which may be made from time to time by the first party to the second party shall not be final or conclusive, but shall be subject to subsequent correction or adjustment when the success or failure of the pictures as a whole can be ascertained. ELEVENTH: It Is mutually agreed and declared that this agreement is personal end cannot be assigned by either of the parties thereto. IN WITNESS WHEREOF, the first party has caused its corporate name end seal to be hereunto affixed by its officers thereunto duly authorised, and the aid second party has hereunto set his hand, the day and year first above written. Party of the first part. 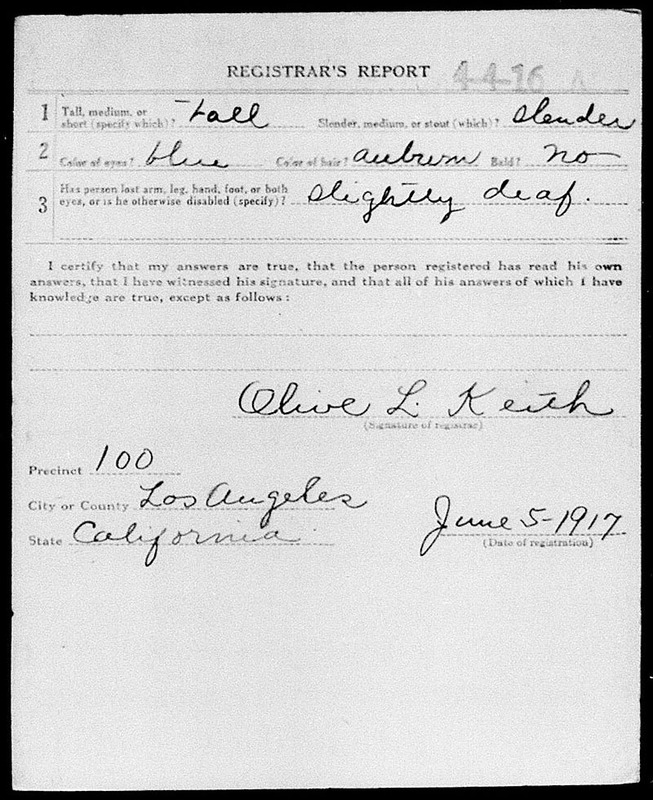 THIS AGREEMENT, made and entered into this twelfth day of December 1923, by and between HAL E. ROACH STUDIOS, a corporation organized and existing under the laws of the State of California, first party, and STANLEY LAUREL, of Los Angeles, California, second party. NOW, THEREFORE, the parties hereto agree with each other that the report of Price, Waterhouse and Company, or of any other responsible certified public accountant or certified public accountants shall be accepted by the parties hereto as conclusive upon the matter of such net profits, and declare that they intend and by said contract intended that if losses are sustained on any of the pictures referred to in said contract, due allowance shall be made therefor in arriving at the amount of total net profits. IN WITNESS WHEREOF, the first party has caused its corporate name and seal to be hereunto affixed by its officers thereunto duly authorized, and the said second party has hereunto set his hand, the day and year first above written. Party of the second party. Poster for a performance of “Karno’s London Comedians” in Salt Lake City, Utah, starring Charlie Chaplin and featuring a young Stan Jefferson, who joined the troupe and accompanied them on their tour of the United States in 1910. 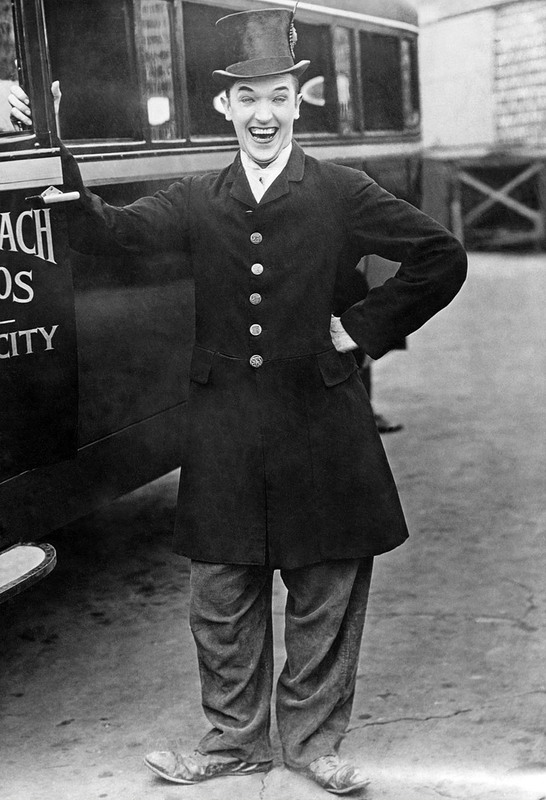 Rolin studios are trying out a comedy in which Stan Laurel, an English comedian, is playing the chief role. Just what plans Rolin has in mind, have not been made public, although it is assumed that the first Laurel comedy will be sent forward to Pathé in New York at the earliest moment for a ‘once-over’ by the famous “Board of Fifteen,” which decides the fate of all pictures that go through Pathé channels. Account retakes or uncompleted picture - not to exceed two weeks. Our privilege to suspend agreement for period not exceeding three months at any one time - upon 90 days notice to Laurel also during strikes, shutdowns a/c fires or other uncontrollable accidents. 90 days on each. option. Agreement suspended if Laurel should become incapacitated for a period longer than one week. 12-1/2% on all pictures featuring Laurel. 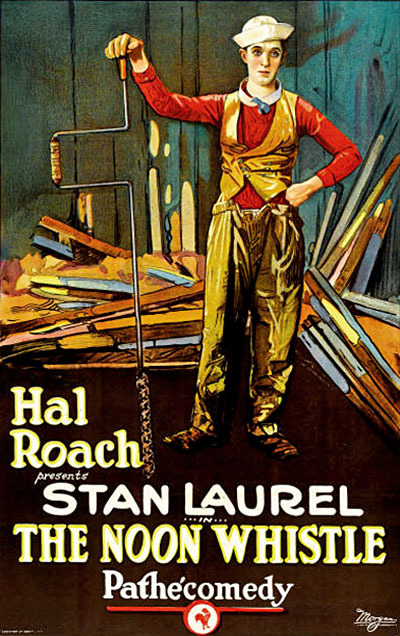 “The Noon Whistle” is a Hal Roach produced silent comedy starring Stan Laurel, released on April 29, 1923. 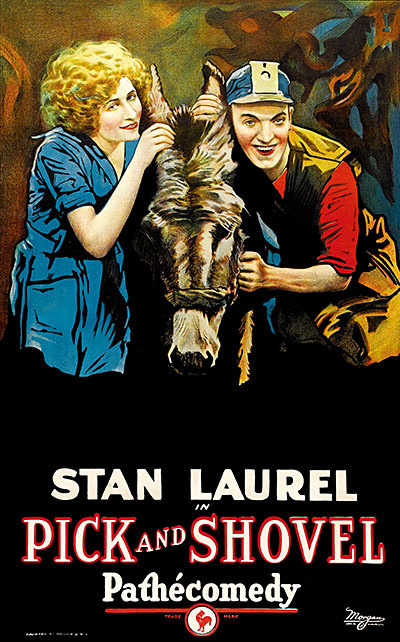 “Pick and Shovel” is a Hal Roach produced silent comedy starring Stan Laurel, released on June 17, 1923.